The end of the year is a good time to look back at the departing year to see what was done and analyze what was achieved. And it is also a good time to set goals for the coming year. Remember that a goal without a plan is just a wish. Start planning your freelance translation business development now! Today it is not enough to buy Proz membership (actually I decided to quit Proz membership and focus on my own website) or just to bid on job portals. Translation market is really tight and, for newbie freelancer, it is hard to stand out against the background of thousands of translators and agencies. Therefore, it is high time to think about complex strategy (if you have not done this yet) for your freelance translation business to achieve sustainable development. Let me be brief: the only efficient way to get more translation projects in 2016 is to elaborate a comprehensive marketing strategy. You may think that a marketing strategy is something difficult and expensive that only large companies can afford, but you are wrong! Being a freelance translator, you’re a businessperson. Thus, you must have a marketing strategy if you want to get more work and earn more money next year. Moreover, this is not that complicated as you may think. In general terms, complex marketing covers both online and offline methods. 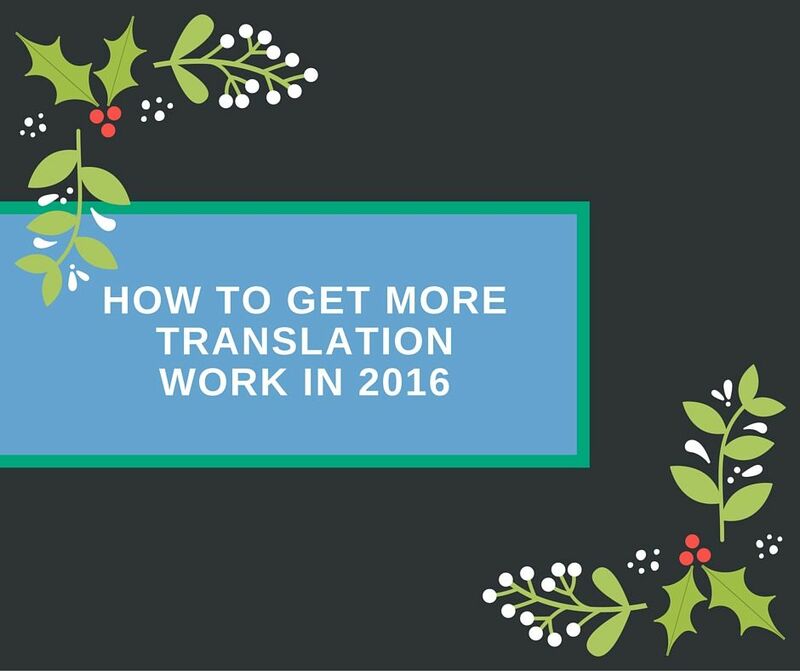 That’s what I will cover in my new blog post to show you how to get more translation work in 2016. Below the post you may download a checklist that will help you to build your own marketing strategy. You may also take a look at this post converted into a SlideShare presentation. Offline promotion methods will always be effective. People still walk in the streets, watch TV, listen to the radio and attend various events. To get more translation work in 2016, you should consider offline promotion methods as one of the possible ways to enhance awareness about your translation business. A good way to promote your services is to attend industry-specific conferences or business events. If you live in a large city or even in the capital of your country, you will easily find several business events during the year where you can meet your potential clients. Prepare promotional materials like business cards, brochures or similar. You may also want to attend some international events held in another country. You can even sign up as a speaker at some events. You will definitely find new prospects and make friends with professional translators from around the world. Another good thing that will add credibility to your business is becoming a member of international translation organization. I work in the translation industry for over 8 years, however, I never applied to any international organization. This will be one of my goals for 2016 (I think about IAPTI). This membership also relates to online marketing, as becoming a member of an international organization you will not only get a certificate but will be listed on the organization website. Oldie TV, newspapers, and similar advertising media are still in use though they are expensive. Try to find the mixture of value and quality: address local advertising agency to find out if this fits you, make a minimum order to see the rate of return on advertising. This method may also be effective and it will cost you nothing. Ask your friends, relatives and existing clients to recommend your services. If you offer high-quality translation, I bet they will be glad to spread the word and you will get some new projects very soon. Online marketing plays an ever-growing role in business development as the internet breaks intercultural and intercountry barriers, offering almost unlimited possibilities to enter new markets and economies. Translators, being a driving force of business globalization and internationalization, should understand the importance of online promotion and take benefits of its methods. In my previous post, I already wrote why every freelance translator needs a personal website. A personal website is a launching ground for your online business. Today you don’t need to know programming languages to start a website. You may actually set up a WordPress website in less than 5 minutes. It’s super easy and will not cost you much. Awesome premium WordPress theme designed by professional developers and a year of hosting from HostGator with one-click WordPress installation will cost you about $130-140 in total. Extra functionally can be easily achieved using various free plugins from WordPress repository. Later I will prepare a blog post with a complete list of plugins required for normal operation of your WordPress site. In other words, you need to create engaging content that helps your target audience (e.g. clients who desperately need your professional translation services) to resolve problems. Having a website and creating content leads to the next step – converting your readers into email subscribers. Start creating email database! According to top e-marketers like Neil Patel, Darren Rowse, and Bryan Harris, email subscribers are the basis of every online business. Quality email database means that you can easily reach your loyal audience in a mouse click. Just take a look at the Facebook home page: its first and main purpose is to get your email address. I have set a goal to reach 1000 subs in March 2016. This is a pretty large audience of translators and I will be glad if you help me to reach this goal. You may subscribe to my blog about freelance translation business below this post by downloading a checklist or in the right sidebar using your Facebook, Google or LinkedIn account. By the way, in one of my next articles about developing a personal website for freelance translators, I will explain how to collect subscribers and what tools I use for this purpose. Guest post is one of the most powerful tools to boost your website traffic in the beginning. You may search for the leading blogs that offer guest blogging opportunities, write an awesome post on a relevant topic that resolves a certain problem of your clients and submit it for consideration of reputable bloggers who welcome guest posts. Of course, this is not an easy task. But if you find the right approach to the blog owner, create an engaging and helpful post I don’t think that your article will be rejected. Usually, the guest post includes a link to the authors web page, that’s how you can get a good deal of relevant web traffic from guest blogging. Online advertising is a complex topic that deserves a separate blog post. There are many online advertising platforms. Google AdSense might be the most famous among them. Principally online advertising can be divided into context ads and banner ads. I know that there is wider classification, but these two items are enough for general understanding. Using AdSense, you can create an ad that will appear on many websites and will lead to a dedicated page of your own website where people can order translation service. To make an ad more targeted, you have to use certain keywords relevant to your business activity. Keyword search and planning tools are integrated into AdSense interface. You should also specify a target country (countries) and several other parameters to make you campaign more efficient and less expensive. The main goal is to cover certain audience and attract it with interesting advertising proposal. However, I would suggest studying additional materials before launching your first AdSense campaign in order not to spend your money in vain. Banner ads on dedicated web portals may be a good way to effectively spend your advertising budget. However, this type of ads is usually more expensive than context. Frankly speaking, you have to try each of the advertising methods to find which one is the best fit for your specific goals, audience, and budget. Search engine optimization (SEO) is the process of affecting the visibility of a website or a web page in a search engine’s unpaid results – often referred to as “natural” or “organic” search. As an Internet marketing strategy, SEO considers how search engines work, what people search for, the actual search terms or keywords typed into search engines and which search engines are preferred by their targeted audience. Over the last several years search engines became much smarter and more complicated to select most relevant content for particular searches. I would not recommend using “black hat” methods like buying links or ordering automated promotion methods as they don’t work anymore. What is even worse, you will be banned while your site will lose its SERP (Search Engine Result Page) position. A good way to optimize your website is to follow Google SEO recommendations and use one of available SEO plugins. For instance, I use Yoast SEO. Social media marketing is another method that can bring you more projects and earnings in 2016. Launch Facebook and LinkedIn business pages, publish interesting content and start building your audience! There are several good services that can automate your social activity. I can recommend the following two services that I use: HootSuite and Buffer. Both of them have free versions. All you need is to sign up, connect your social pages and schedule posts (both from your personal website and from other sites). I will also appreciate it if you join my Facebook and Google+ pages where I regularly share interesting and useful content. This is not a complete list of activities that can bring you more clients in 2016. However, if you develop your personal plan based on the above points and follow it on a daily basis very soon you will find increasing flow of work and new clients waiting for your professional services.